When I see green tomatoes for the first time in the summer I get excited because I know that in a few short weeks I will be slurping up their juicy, well-ripened siblings. I admit it, I am not the biggest fan of under-ripe fruit like green tomatoes, but for everything there is a season and this is the time of year when one ought to enjoy crisp green tomatoes and dream of things to come. Part of the reason I have never really developed a taste for green tomatoes is that I also have an aversion to deep frying which is by far the most common preparation. 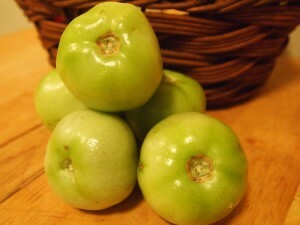 When they are done well, fried green tomatoes are crisp and the oil and batter have infused a little flavor. However, most of the time fried green tomatoes are greasy, limp, and flavorless. This year we took on the challenge of making a couple of delicious green tomato recipes that go in a different direction. To this end, we came up with Green Tomato Aji and Green Tomato Quiche. Both of these recipes do a great job highlighting the freshness of green tomatoes and uncover their versatility. So, while it is still a far cry from the rapture I expect when I bite in this year’s first ripe red tomato, these green tomato recipes do a good job paving the way.